Welcome to my website where you will find many examples of my work. I hope you enjoy browsing, and please use the Contact page if you want to ask any questions or if you are interested in any of my pictures. I'm happy to discuss commissions including portraits from photographs. I am a member of the in Amersham, Buckinghamshire, the and the . 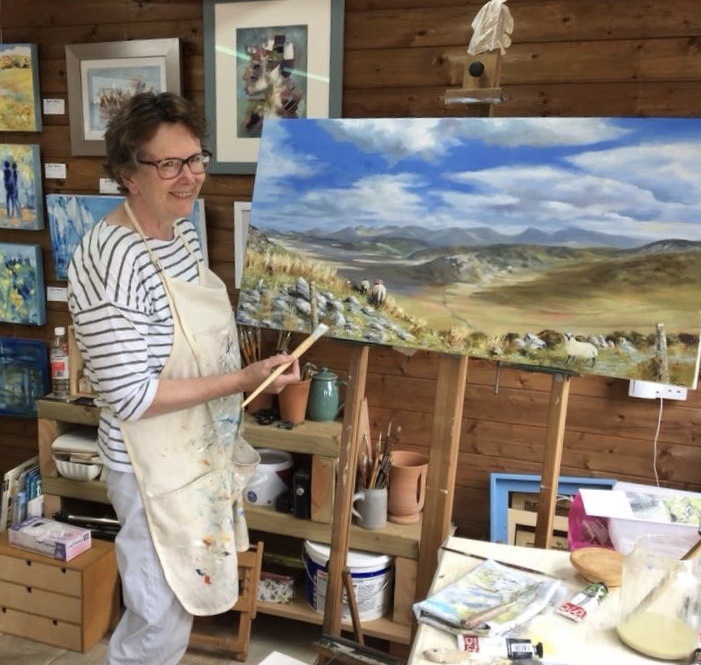 I work mainly in acrylics, both on paper and on canvas, and also in oils, soft pastel and oil pastel.You'll see from the Gallery that I work in many different styles – that makes it all very exciting for me! I enjoy vibrant colours and strong tonal contrasts. I also hugely enjoy drawing the human form from life and am a regular at a life drawing class run locally by enthusiast and teacher Phil Dearman. Bucks Art Weeks in June were a joy – and the icing on the cake was selling five paintings. I thoroughly enjoyed chatting with visitors and in quiet periods getting on with a large realistic landscape based on a photo from our May holiday in Ireland. The view is towards Killarney from the Bealach Oisin pass. Thanks to Nathalie Pymm for taking the photo. In October 2016 I was commissioned to paint a portrait of TS Royalist, Flagship of the Sea Cadets. 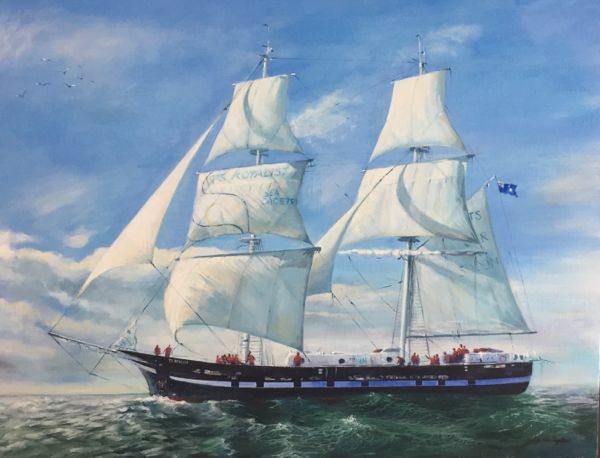 The painting was presented to the ship on 11th March 2017 and has been hung in the wardroom on board. It was a privilege to paint this picture for the Marine Society & Sea Cadets which does inspirational work with young people from all over the UK. Copyright © Jackie Hornby 2014-2019. All photographs and unsold artworks are the exclusive property of Jackie Hornby. Photographs and artwork may not be reproduced without prior permission being obtained in writing either from Jackie Hornby or the purchaser. Copyright © 2014-2019 Jackie Hornby must be published alongside the photograph or reproduction if permission has been granted in writing. Website designed by Peppercorn Publications.